Okay, so it’s fair to say we’re absolutely ombré obsessed, from the most gleaming of blondes to glowing brunettes! But this dreamy ‘do doesn’t have to be reserved for the natural look. Vibrant purple ombré is taking our hair goals to an entirely new level, and it’s completely doable at home. 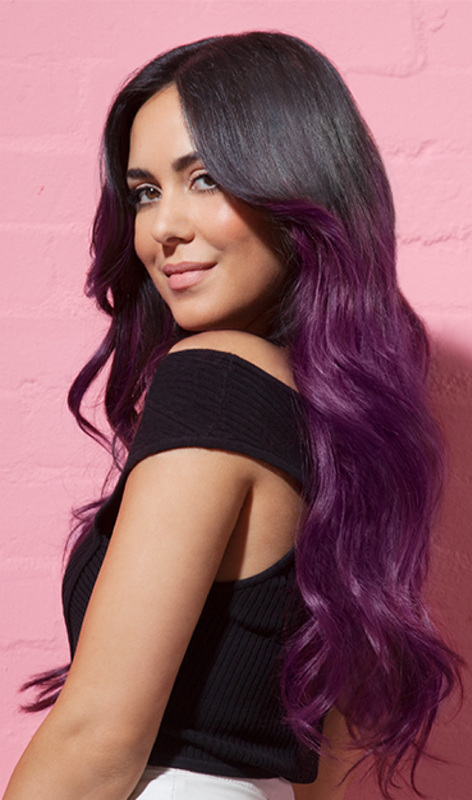 Here’s everything you need to know about perfecting that purple ombré look. Time to prep your locks! You’ll need to start with a light blonde base tone for the purple to be really vibrant. If you haven’t already got either lightened or natural light blonde hair, now’s the time to get pre-lightening with one of our LIVE Intense Lighteners. If you’ve already got colour on your hair, it’s possible you’ll need to grow this out before attempting to bleach at home (depending on your shade and frequency of dyeing). For some more expert tips and advice on this or generally on lightening your hair at home, you can always have a quick chat with our Advisory team on Freephone 0800 328 9214. Once you’re happy you’ve got the ideal base colour, grab a box of our Ultra Brights Purple Punk shade (if you’ve got long or thick hair, you may need a couple of packs). Get familiar with the Instruction Leaflet and don’t forget to perform a strand test before colouring. If you’re not sure how to do a strand test, check out our article here. Your hair should be damp and clean before starting and you’ll need to wear the in-pack gloves, as well as an old towel to help prevent staining. Adding some petroleum jelly to your hairline will also help to ensure that it’s just your hair that’s being coloured. Now it’s time for the colouring! Have an idea of where you want the ombre blend to start - around your jawline is usually a good bet. On shorter hairstyles, you can decide whether you want more of an ombre ‘tips’ look or if you prefer to, stick to roughly half and half of each colour - both will suit just fine! Get an idea of where you want the ombré blend to start. Apply the Purple Punk straight from the Colour Cream tube. Work the colour through your hair lengths. Sit back for 15 mins to let the colour develop. Rinse the gloves before moving on to the next section. With gloves back on, grab a non-metallic bowl and mix some more Purple Punk with the in-pack conditioner or new LIVE Pastel It! to create a pastel shade (check the Instruction Leaflet again for specifics) - the more conditioner added, the more pastel the shade will become, it’s totally up to you how pastel you want to go. Work the pastel shade through the bottom half of the hair and smudge the two shades together where they meet. Again, you can use a toothbrush or a tint brush to help you if you prefer. Wait for up to 5 more minutes to let the pastel colour develop, rinse your hair until the water runs clear and finish with the conditioner for touchably soft tresses. Work the pastel shade through the bottom half of the hair. To keep your colour looking as vibrant as ever, make sure you don’t over-wash your hair, and only use shampoos and conditioners specifically designed for coloured hair, like our Color Expert Colour Sealer Conditioner. Our multi-tasking, semi-permanent Ultra Brights shades can also be used for an easy, in-shower colour top up - check out our video here for the method. And don’t forget, you can always save any of the Ultra Brights Colour Cream that you don’t use for the next top-up, just screw the lid back on nice and tight. Remember when those roots do start to appear, only lighten and/or colour your natural root colour - no need to do your entire head of hair. And there we have it. You’ve got the purple ombré look down to perfection - just pair your hair with a monochrome ensemble to let those vibrant hues do the talking. Be sure to tag those ombre snaps with #LIVEColour for the chance to get featured on our Insta.